An Indian company, a joint venture with one of world's larger solar power companies, asked us to design and develop solar road studs suitable for Indian road conditions. These studs, embedded in the road surface along the median, were to be powered by solar rays through a rechargeable battery to light up flashing LEDs when dark or in conditions of poor visibility because of weather. These flashing LEDs were to guide drivers to drive safely on their side of the road and thus help avoid accidents. The studs were to be water and weather proof, and also resistant to breaking under wheels of a loaded moving vehicle. 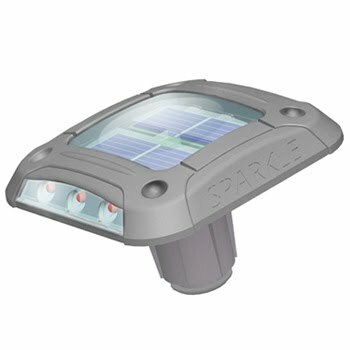 Our brief included mechanical design of a die-cast aluminium housing to accommodate solar cells, electronics, battery and LEDs to achieve all requirements. We also worked with tool makers and manufacturing engineers to produce the housing and the stud assembly.